The neighbors next decided to tackle the tallest standpipe in the area. It is 7-foot-tall and had an ugly lump in the middle where two pipes had been joined to create the height needed for the gravity feed irrigation system. It was also unique in that it had a whole empty corner surrounding it. 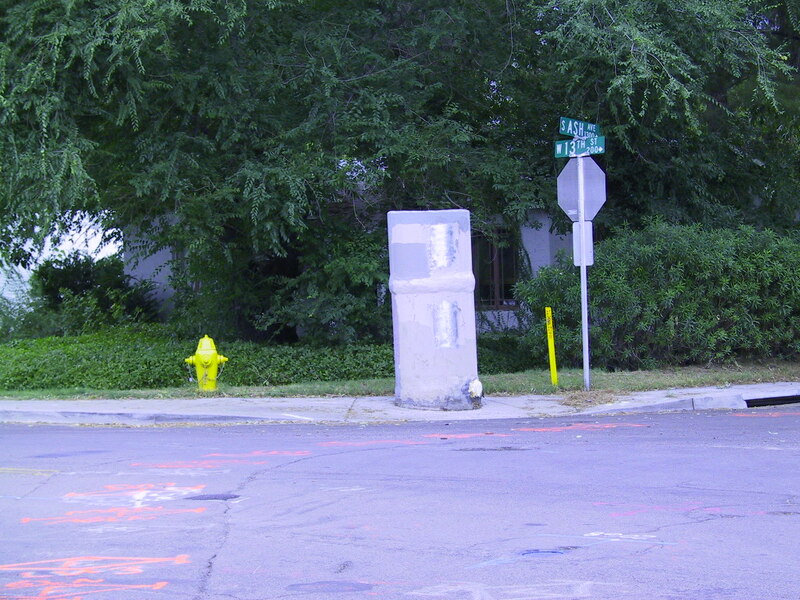 We decided to use the whole corner and make a small plaza around the standpipe. Landscape architect Ruben Valenzuela volunteered his time to help us plan the use of the whole corner. 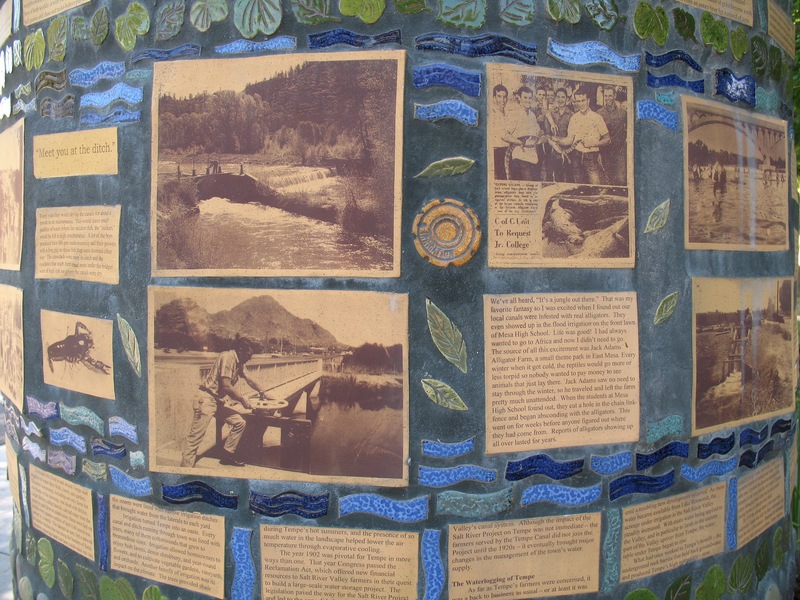 Chris Rowley created the ground level river design that flows to and from the standpipe, symbolizing how water enters the irrigation system. Jenni Lucier donated the piece of WPA sidewalk that we turned into a bench. 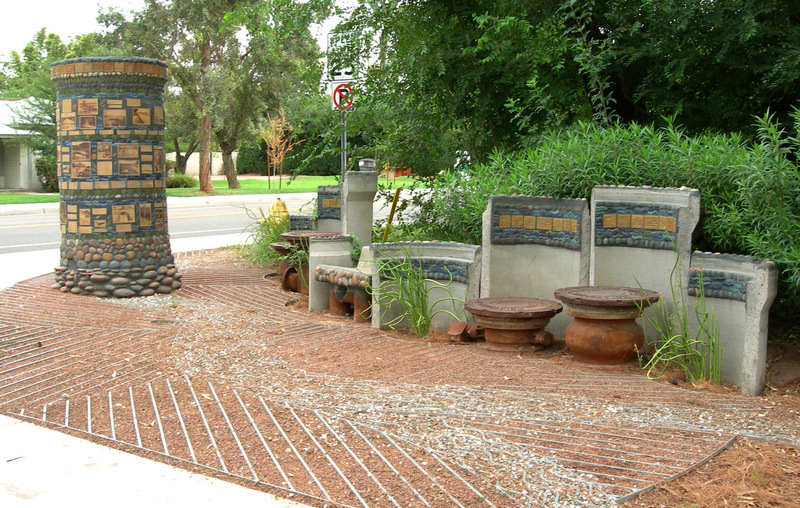 SRP donated the various pipes and irrigation manhole covers that make up the seating. And SRP also cut pipes to our specifications for the backs of the seats. They even delivered the cut pipes to the site. Before installation of any tiles, I smoothed out the lump in the standpipe with the same type of Styrofoam, fiberglass mesh, and polymer fortified cement that is used in building houses. I also added a bell shape at the top to create a more finished look. That is where we placed the band of irrigation tiles. 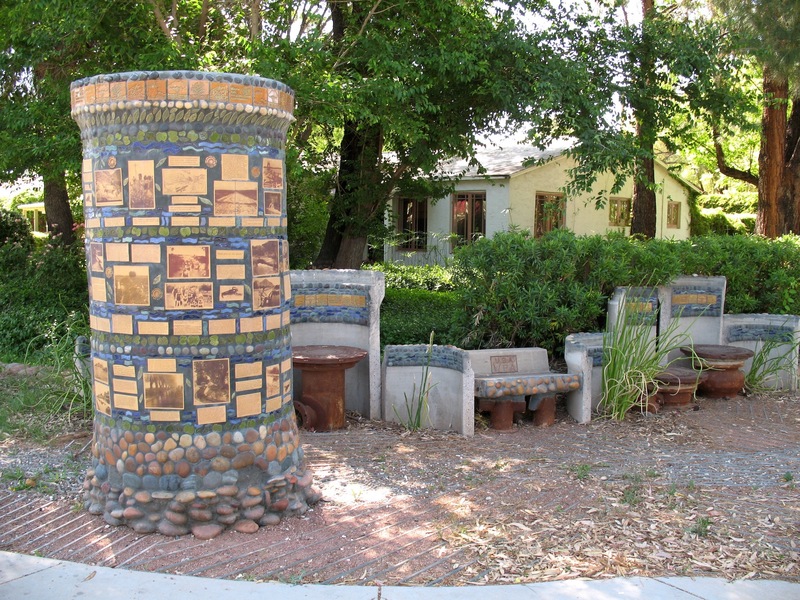 We designated this as the irrigation standpipe where the neighbors could tell their stories about living with the routine of summers of flood irrigation periodically filling their lawns. Volunteers collected stories and photos and decided which to use. Special thanks to Jenni Lucier and Julia Andrews. I turned those into text and photo tiles with a process that uses the iron oxide in some printers. 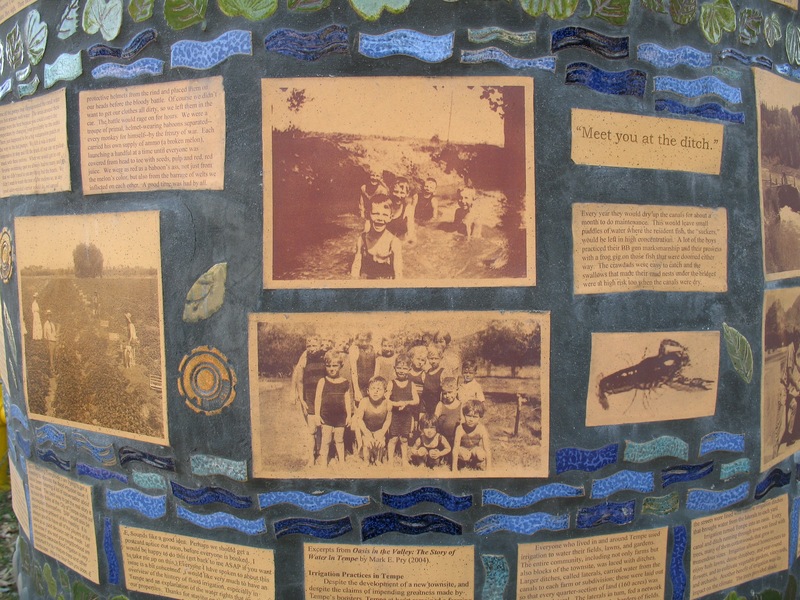 When fired in the kiln, iron oxide became photos and text printed onto the tiles. Then a whole lot of neighbors volunteered to put it all together. It was quite an undertaking! But now Maple Ash has its own “plazita” under the big trees that shade it.